There are some ignorant teachers today, who claim that the Rapture is not a Biblical teaching. They are wrong. As you just read in 1st Thessalonians 4:17, the saints will be “CAUGHT UP” into the air to meet with the Lord. I believe 100% in a Pretribulation Rapture and I've never used it as an excuse not to care, nor to think that I'll be Raptured so I don't have to deal with the problem. I, as much as anyone, am speaking out against the Communist New World Order. Although the New World Order is inevitably coming, we have a Biblical obligation as true Christian believers to rise up against the evils of Communism, corruption in government and the wicked agendas of our generation. I have never used the Rapture doctrine to avoid my duty as a Christian to stand for the truth. Any Christian who uses the Rapture as an excuse not to be a good soldier of Jesus Christ is not pleasing the Lord. I realize that many pastors don't want to get involved in the fight against the New World Order, and it's wrong on their part. Although we are pilgrims and strangers passing through this earthly world, God never intended for Christians to bury our heads in the sand and become indifferent toward evil, sin and corruption. The Scriptures plainly teach a Rapture of the saints, when the Lord Jesus will remove the Church from the world . . .
All Christians will be removed from the earth at the Rapture. However, the Bible teaches that sinners will be saved after the Rapture, during the Tribulation Period (Revelation 7:14). We read in the Book of Revelation that the Beast will make war against the saints (Revelation 13:7). These will be people saved during the 7-year Tribulation. After the Tribulation period, the Second Coming of Christ will happen, when the Lord will return WITH His saints. 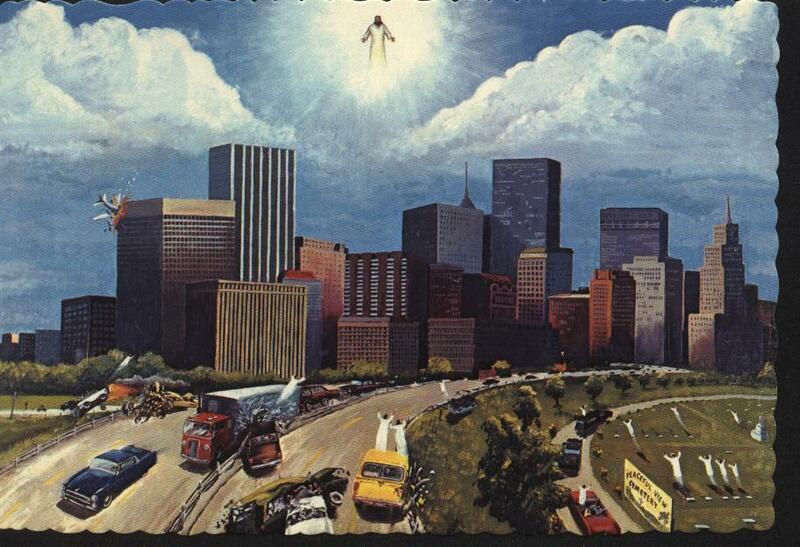 Jesus is coming at the Rapture FOR His own. Jesus is coming at the Second Coming WITH His own. In 1st Thessalonians 4:18, the Bible says to “comfort” one another with these words. Certainly, there would be no comfort knowing that one would have to suffer all the atrocities of the Tribulation Period. It will be a time of woeful torment and misery, unprecedented in human history. Just as God removed Noah and his family before the flood came and the wicked were destroyed, so will He remove the saints from the earth. Just as God removed Lot and his family before Sodom and Gomorrah were utterly destroyed, so will He remove the saints from the earth. God will remove the Church prior to the Tribulation Period. There's a lot of arrogant people today, people of reputation, who know nothing about the Bible, who speak of things which they understand not, condemning God-fearing church congregations with the apostate, saying that the Rapture is not found in the Bible. May I say, the Rapture is clearly and plainly taught in 1st Thessalonians 4:17. The King James Bible is the only reliable Bible in English. All modern Bible versions have been corrupted. Howbeit, even the corrupted New International Version hasn't tampered with 1st Thessalonians 4:17. So whether you have a trustworthy King James Bible, or a contemporary imposter, the teaching of the Rapture is taught. So those who ignorantly claim that the Rapture is not found in the Bible don't know what they are talking about. It's just a bunch of lying propaganda intended to discredit the Word of God, thwart believer's hope of the Rapture and do injustice to the Body of Christ. The Bible speaks of the “HOPE” of the Lord's return. Titus 2:13, “Looking for that blessed hope, and the glorious appearing of the great God and our Saviour Jesus Christ.” As Bible-believing Christians, we have a present hope in the Lord's return. Jesus promised in John 14:1-3 to come back and get us, to take us to a “PLACE” He is preparing for us in eternity. . . There is much prophecy in the Scriptures concerning the future, and God's wonderful provisions for all those who believe on Jesus, the Christ, the Son of God. If you take the Bible at face value, you can only conclude a Pretribulation Rapture. Is the Rapture a New Teaching? As with everything else on my website ministry, you are freely welcome to copy and paste these articles and images to your own website.